See the next in line of the genius products created by the finger-licking good brand. KFC are hoping to bring back the magic of KFChristmas by transforming some of their most-loved products into festive decorations. Watch their ad above, courtesy of KFC New Zealand. 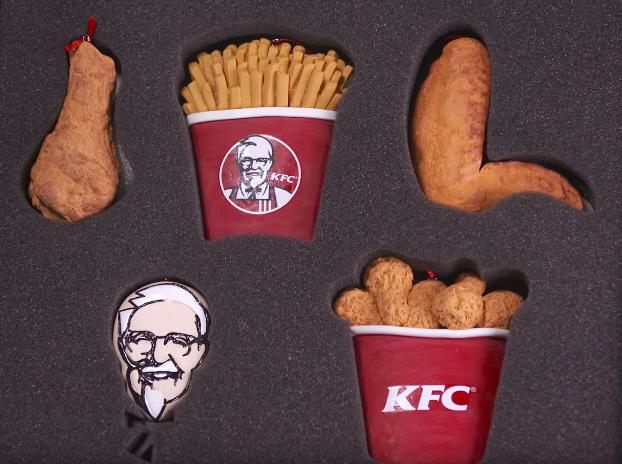 Their drumstick, wings, fries and classic KFC bucket have been made into hanging ornaments, alongside a version of the Colonel himself. Who thought fried chicken could be so appealing when hanging on a Christmas tree? It's not the first time the fast-food chain has cooked up some out-of-this-world merchandise. Earlier this month the KFC Japan released a bath bomb that smelled like their secret blend of herbs and spices. Last Christmas also saw them release a chicken-scented candle so fans of the fried stuff could sit back and relax of an evening. And just in case it was all a bit too Christmas-centric for you, last August the chicken chain created their very own Sunscreen... which smelled of you guessed it - Chicken!